SANTA ROSA ISLAND — After a long delay in the construction of a new pier at Santa Rosa Island, a new facility finally opened Sept. 14, providing improved access to the 53,000-acre island in Channel Islands National Park. 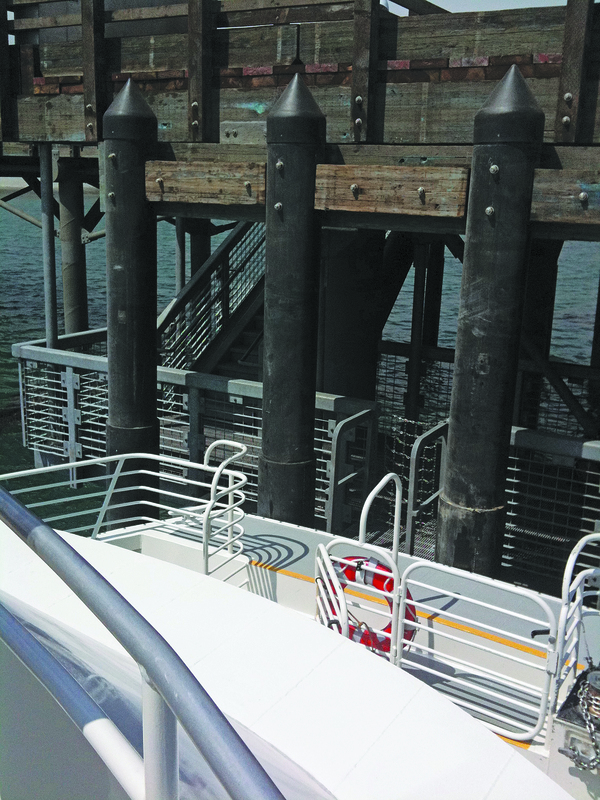 According to Yvonne Menard, chief of interpretation for Channel Islands National Park, the final inspections were completed the week of Sept. 12 and the Island Packers ferry Island Adventure made its first landing since the previous pier closed in June 2009. Menard explained that during construction, a new guideline for pile driving was instituted, which caused a work delay until it could be implemented. The new approach used an auger to drive the pilings in place, with an anti-corrosive casing surrounding each piling. This one-step process reduced turbidity by preventing cuttings and other debris from entering the waters in Beechers Bay, where the pier is located. After years of extensive repairs and maintenance, it was time for the old pier to be completely replaced. The pier had suffered serious deterioration from winter storms, coupled with heavy corrosion caused by the marine environment that affected the pier’s structural integrity. The newly constructed pier is built on the same footprint as the historic pier, measuring 574 feet in length. The height of the pier was raised by 7 feet, to make it 23 feet above mean low water to reduce damage caused by high storm surge. However, it still connects to the shore at an elevation matching the original pier elevation. It now has tiered landing pads that will make it easier for private boaters to offload passengers. As at all the islands’ piers at Channel Islands National Park, boaters are not permitted to tie off on the pier. According to Mark Connolly, president of Island Packers Co., the main concessionaire of ferry service for Channel Islands National Park, the absence of the pier had caused a decline of more than 50 percent in their business, since visitors had to be skiffed ashore. “It takes so much more time out of each landing and departure,” Connolly said. Capt. Lee Fleischer, one of the captains of Island Adventure, said he was glad to land at the new structure on the day it opened. “It’s great to have the pier back. It makes a real difference for passengers to easily load and unload on such a solid structure,” he said. The pier is expected to receive more than 700 vessel landings annually — including park boats, island ferries and private boats. “Over 7,800 visitors each year come to experience the beauty of Santa Rosa,” Menard said.